I have a handful of recipes that I use over and over again and never tire of. This is one of them. 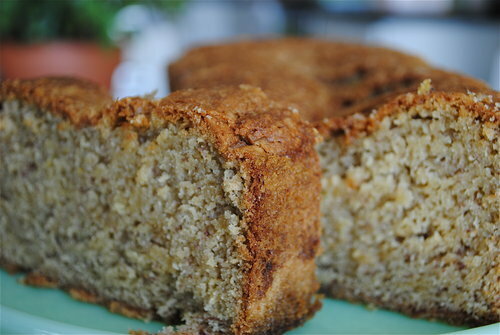 It is beyond good, in fact, I have never tasted a banana bread that compares. It’s buttery, it’s tender, and has the most amazing caramelized sugar crust that you will love when you take a bite. Cream together butter and sugars. Mix in eggs and vanilla. Add flour, soda, and salt. Be sure not to over mix, as it will result in a heavier bread. Fold in cream and banana. Pam loaf pan (standard size). Take about a 1/3 cup of Sugar In The Raw or use brown sugar (this sugar is not listed in the recipe above) if that’s all you have. Press the sugar to the bottom and sides of your pan. The Pam helps it adhere, but don’t give yourself a headache if a lot of it slides to the bottom- it’s normal. Pour in your batter and smooth the top. Bake at 350 for 50 minutes. If a toothpick comes out clean, it’s done. Just made this today, and it turned out so good! Thanks!! I'm really into banana bread! I must make this!! Thanks!